Our team at Ryerson is expanding to include three new executive roles (Assistant Team Leader, Outreach Coordinator, and Communications Coordinator). We’re looking for committed students and community members to help out in different areas of activism and team building. Are you passionate about human rights, and interested in getting involved with the pro-life community? Your courage, compassion, and conviction could make a huge difference on the Ryerson Campus this year as we continue to defend pre-born children. Organize weekly activism, and connect with Speakers and Pro-life organizations as needed. Implement strategies to most effectively make abortion unthinkable within the Ryerson community. Coordinate with other Executive Team Members, and foster team development. Use social media and our blog to reach more people with the truth about abortion. Help plan and facilitate weekly meetings. Communicate with team members about team activities, such as weekly meetings and activism. Record Minutes during Executive and General Meetings. “I was not new to the cause, or uninformed. My daughter, Talia is the Team Leader for the Ryerson team of TAA. We had heard the stories, good and bad. But still, I was not prepared. I was not prepared for the camaraderie of the group. All ages, various backgrounds, but genuinely joined for a cause that takes precedence. A cause that takes precedence over comfort–it was freezing! And a cause that takes you out of your comfort zone. It’s not easy being the sign bearer that others cross the street to avoid. Or to directly be singled out with a verbal barrage. I was certainly not prepared for the blessing it was. For the heart-lift when someone gave a thumbs up. For the inner warmth at the whisper from a passerby, I’m with you. Choice chain? Not for the faint of heart…but, don’t miss it. Don’t wait until you take an apologetics class or study about how to state your case. Just, volunteer. Be there. Be present. Hold a sign. If you don’t know the answers, someone in the group does. You just have to start others thinking about their own questions. Is that really what it looks like? Is that what happens in an abortion…. Is that really okay? 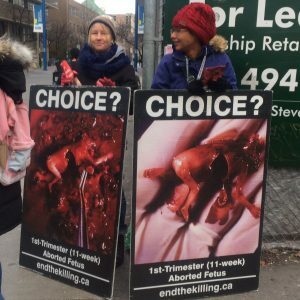 Email ryerson@torontoagainstabortion.org to find out how you can be a voice for preborn children at the Ryerson Campus.